With nearly three dozen shipyards spattered across the globe, Damen Shipyards Group based in the Netherlands is one of the world’s most active shipbuilders. Maritime Reporter & Engineering News examines the flurry of activity perpetuated by the shipbuilding and repair conglomerate. The Damen Shipyards Group reported a turnover of €2 billion in 2017, a year in which it delivered 165 newbuilds, including 64 tugs and workboats, five offshore vessels, 40 high-speed craft and ferries, 12 pontoons and barges, 23 dredging and specialty vessels, 16 vessels for defense and security and five yachts. The shipbuilder has not slowed down in 2018, continuing a fast-paced delivery schedule while beginning on a number of new vessels and refit projects. 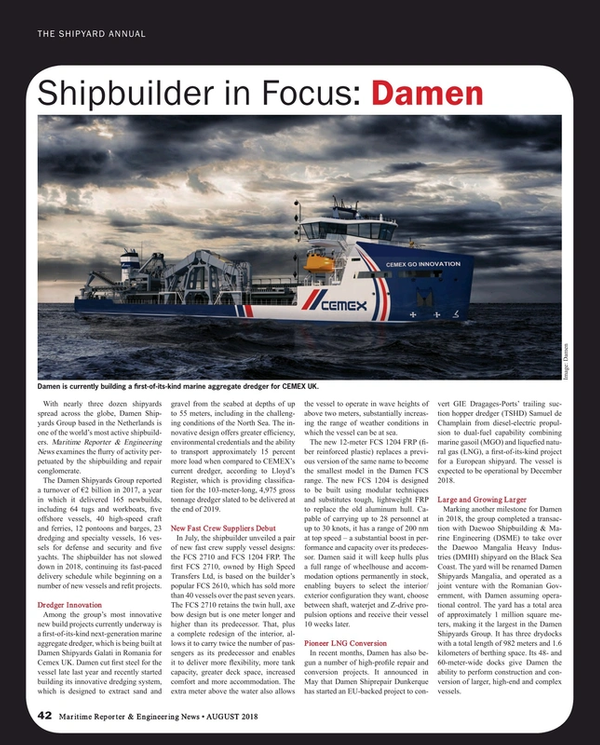 Among the group’s most innovative new build projects currently underway is a first-of-its-kind next-generation marine aggregate dredger, which is being built at Damen Shipyards Galati in Romania for client Cemex UK. Damen cut first steel for the vessel late last year and recently started building its innovative dredging system, which is designed to extract sand and gravel from the seabed at depths of up to 55 meters, including in the challenging conditions of the North Sea. The innovative design offers greater efficiency, environmental credentials and the ability to transport approximately 15 percent more load when compared to CEMEX’s current dredger, according to Lloyd’s Register, who is providing classification for the 103-meter-long, 4,975 gross tonnage dredger slated to be delivered at the end of 2019. In July, the shipbuilder unveiled a pair of new fast crew supply vessel designs: the FCS 2710 and FCS 1204 FRP. The first FCS 2710, owned by High Speed Transfers Ltd, is baes on the builder’s popular FCS 2610, which has sold more than 40 vessels over the past seven years. The FCS 2710 retains the twin hull, axe bow design but is one meter longer and higher than its predecessor. That, plus a complete redesign of the interior, allows it to carry twice the number of passengers as its predecessor and enables it to deliver more flexibility, more tank capacity, greater deck space, increased comfort and more accommodation. The extra meter above the water also allows the vessel to operate in wave heights of above two meters, substantially increasing the range of weather conditions in which the vessel can be at sea. The new 12-meter FCS 1204 FRP (fiber reinforced plastic) replaces a previous version of the same name to become the smallest model in the Damen FCS range. The new FCS 1204 is designed to be built using modular techniques and substitutes tough, lightweight FRP to replace the old aluminum hull. Capable of carrying up to 28 personnel at up to 30 knots, it has a range of 200 nm at top speed – a substantial boost in performance and capacity over its predecessor. Damen said it will keep hulls plus a full range of wheelhouse and accommodation options permanently in stock, enabling buyers to select the interior/exterior configuration they want, choose between shaft, waterjet and Z-drive propulsion options and receive their vessel 10 weeks later. In recent months, Damen has also begun a number of high-profile repair and conversion projects. It announced in May that Damen Shiprepair Dunkerque has started an EU-backed project to convert GIE Dragages-Ports’ trailing suction hopper dredger (TSHD) Samuel de Champlain from diesel-electric propulsion to dual-fuel capability combining marine gasoil (MGO) and liquefied natural gas (LNG), a first-of-its-kind project for a European shipyard. The vessel is expected to be operational by December 2018. Marking another milestone for Damen in 2018, the group completed a transaction with Daewoo Shipbuilding & Marine Engineering (DSME) to take over the Daewoo Mangalia Heavy Industries (DMHI) shipyard on the Black Sea Coast. The yard will be renamed Damen Shipyards Mangalia, and operated as a joint venture with the Romanian Government, with Damen assuming operational control. The yard has a total area of approximately 1 million square meters, making it the largest in the Damen Shipyards Group. It has three drydocks with a total length of 982 meters and 1.6 kilometers of berthing space. Its 48- and 60-meter-wide docks give Damen the ability to perform construction and conversion of larger, high-end and complex vessels.